Exercise doesn’t always go as planned. There will be days (and maybe even weeks) when you simply don’t want to do anything. This is true even for elite athletes and fitness professionals. But you can dramatically increase the chances of sticking with a routine and achieving your goals with the right fundamentals in place and a solid plan that works even when you really don’t want to work out. But what should you do before the habit is ingrained? And what can you do on those days when you just don’t feel like exercising? That is when having a motivation system can be the difference between success and failure. Let’s dive into some specific strategies you can use to motivate yourself to exercise when you really don’t want to. One critical factor is essential to your success: you have to know what you want and why you want it. It sounds simple, but many people don’t have clearly articulated goals, nor have they identified the personal reasons behind those goals. Those aren’t just the surface reasons, but the deeply rooted reasons you want something. If you don’t want it badly enough you won’t be willing to put in the work, especially when it’s inconvenient, hard, or boring. 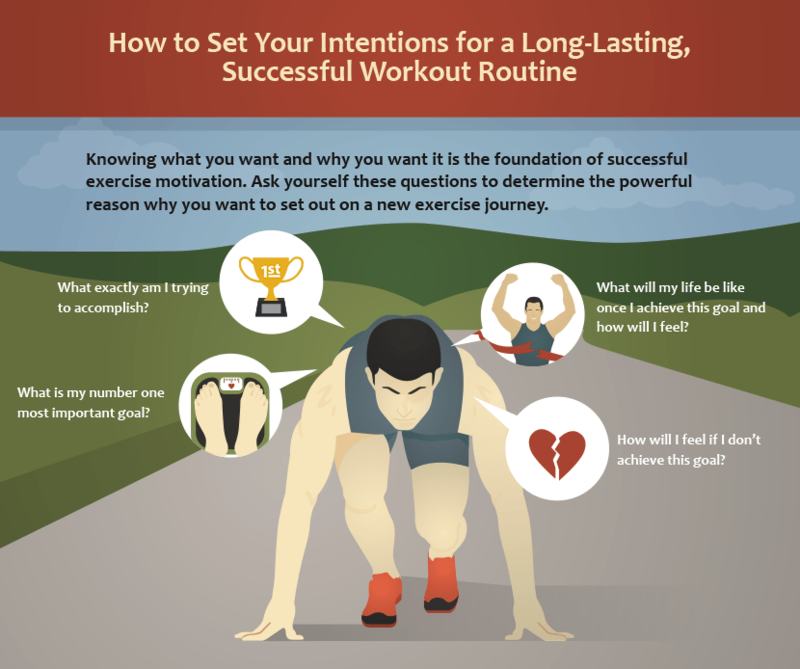 Knowing what you want and why you want it is the foundation of successful exercise motivation. If you skip this step or don’t take it seriously, you can forget about implementing the rest of the motivation strategies below. They may work temporarily, but your long-term success is less certain. And yet most of the motivation tips and articles you’ll find online leave out this critical step. Sure, you may want to run a marathon or lose 20 pounds – and those are great goals – but why do you want to achieve them? If it’s just so that you can “get healthier” or “have more energy,” those aren’t very compelling reasons. And in a moment of weakness, those vague goals probably won’t be powerful enough to motivate your exercise habit. On the other hand, if you want to be the best spouse, parent, or friend you can be; if you want to be able to play with your grandchildren someday; if you want to see what you’re truly capable of achieving in this short life you’ve been given; or if you want to serve others to your utmost ability, then you may have discovered a powerful reason “why” that will carry you through some of your toughest days and help create your inner strength. What is my number one, most important goal? What will my life be like once I achieve this goal and how will I feel? How will I feel if I don’t achieve this goal? If you don’t already know the answer to these questions, take time to set your intentions before you implement any of the following strategies. There is not just one motivational trick that works for everyone. Keep in mind that some of the following strategies will work better for you than others. The more personalized strategies you integrate into your plan, the more likely you’ll succeed. 1. Take baby steps toward your goals to simplify the process and increase your confidence. Baby steps are the building blocks of habits. And then once you have habits in place, motivation strategies will no longer be as crucial to your success. Know what your end-goal is, then focus on the small steps you need to take to get there. If you make the necessary tasks simple enough, then chances are they’ll be easier to accomplish. When you do succeed with each baby step, you’ll feel more motivated to keep going. Whatever you decide on, make it realistic so you can put in the work each day. 3. Celebrate small wins (and do it often in the beginning). If your goal is to get out the door for a 15-minute run two times a week, reward yourself when you succeed. It doesn’t have to be anything huge. Something as simple as making your favorite smoothie can help reinforce your positive habits. Take a moment to reflect and be proud of what you’ve accomplished. Keep in mind that over time, small wins add up to big victories. Baby steps! 4. Use a training journal to track your progress. Actually seeing your accomplishments written down in a journal is very motivating. You can look back and say, “I did something today that I couldn’t do last week.” If you keep this up for several weeks, months, and eventually years, you’ll start to believe that anything is possible. 5. Keep your mind focused on the prize. In her TED Talk on why some people find exercise harder than others, social psychologist Emily Balcetis says her number one trick to help people exercise is to, “Keep your eyes on the prize.” Focus on what you’re trying to achieve. If you want to look better, feel better, perform better, live longer, or get to watch your grandkids grow up, focus on that every time you think about quitting or skipping a workout. Recalling that goal, or prize, actually changes our perception of exercise, making it seem easier. So don’t think about all the work that needs to be done, how long it’s going to take, or how hard it’s going to be. Just keep your eyes on the prize. 6. Work your system and focus on process-oriented goals. A goal by itself is not much more than a wish or a dream. Goals are pretty hard to reach without putting a system in place. Beyond outcome-based goals (for example, I’m going to run my local 5k race in 25 minutes or less), set process-oriented goals (for example, I’m going to go on at least three runs per week and run just a little better each time). Figure out the day-to-day tasks you need to perform to succeed. 7. Make your small goals easy, so success is inevitable. Before you commit to any exercise routine, whether you want to start running or lift weights, ask yourself how likely you are to comply with your plan. If you’re not 100 percent sure you will follow through, then make it easier. Once you achieve your first goal, you can set more challenging goals down the line. 9. Think about how great you’ll feel when you’ve finished your workout. Not only will your body be pumping all sorts of feel-good hormones, but you’ll also feel incredibly accomplished after a run or a workout. You can also think about (but not dwell on) how lousy you’ll feel if you don’t exercise. 10. Finish each workout feeling better than when you started. If you always feel exhausted and run down after your workouts, then it’s going to be hard to stick with them. Working hard is fine, but don’t grind yourself into the ground. If you do some high-intensity exercise, make sure to do something easier at the end and include a cool down. 11. 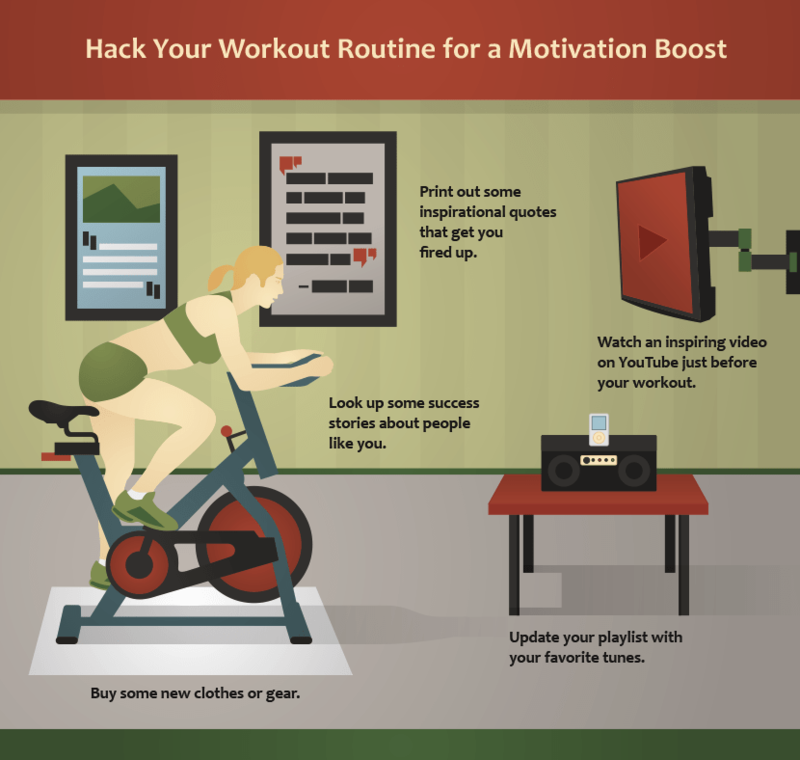 Hack your motivation for a temporary boost. Do whatever you’ve got to do to get yourself pumped and then make the most of that energy. This is not a good long-term strategy, so use it sparingly. 13. Make a deadline. Schedule a deadline in conjunction with a special event like a vacation at the beach (even if it’s just a day), a reunion, or a big race. If you know you need to be at your best on a certain date, you’ll make the best use of your time. 14. Get support and accountability. This is the most powerful motivation strategy there is, even for introverts. Extensive research has shown social support is a key factor in determining success in an exercise program.4 Find a training partner, join a fitness class, or hire a running coach. There are many forms of online social support, too. Join a forum or Facebook group. Sign up for a 30-day fitness challenge. The more people involved with your success, the better. 16. Do what you love and you’ll never have to motivate yourself again. If you hate running, then don’t run. If gyms intimidate you, don’t join one. Find something physically active that you genuinely enjoy doing, or even maybe something you do just for the fun of it. Hiking, dancing, playing Frisbee, or pickup basketball are all great ways to get your heart rate up. If you enjoy yourself, it won’t feel like a workout. Research has consistently shown that workouts with intrinsic value are more desirable and easier to comply with than those that don’t.5 So, give yourself permission to have fun and do the stuff you enjoy. 17. Have a Plan B for those days you just don’t feel like it. The plan can be as simple as, “Just start by putting on my workout gear,” or, “Just get through the standard warmup.” You can also do something active or fun that isn’t necessarily on your program (like go to a fun class instead of a run). Remember to focus on action, even if that action is a little different from what you had planned. 18. Make yourself an offer you can’t refuse. I once heard a story about someone who wrote his friend a check for $500 and told him to cash it if he didn’t get his weight under 200 pounds by a certain date. Talk about tangible motivation! You don’t have to go to this extreme (although maybe you want to). For this to work, the consequence of not achieving your goal needs to be strong enough to motivate you to action. Some of these motivation strategies will help you immensely and others won’t be right for you. Use these ideas to build a custom plan. If you focus on the strategies that will help you the most, you can create your own motivation system to keep at it. Focus on the strategies you know will make the biggest difference for you individually. If you have enough backups of “motivation security” in place, then you’ll have a greater chance of reaching your goal, even when you really don’t feel like working out. Jason was the overall 1st-place winner at the 2011 Moraine Hills Half Marathon, 2012 Maryland Warrior Dash, and 2013 ...	Read more articles from Jason on Thought Catalog.